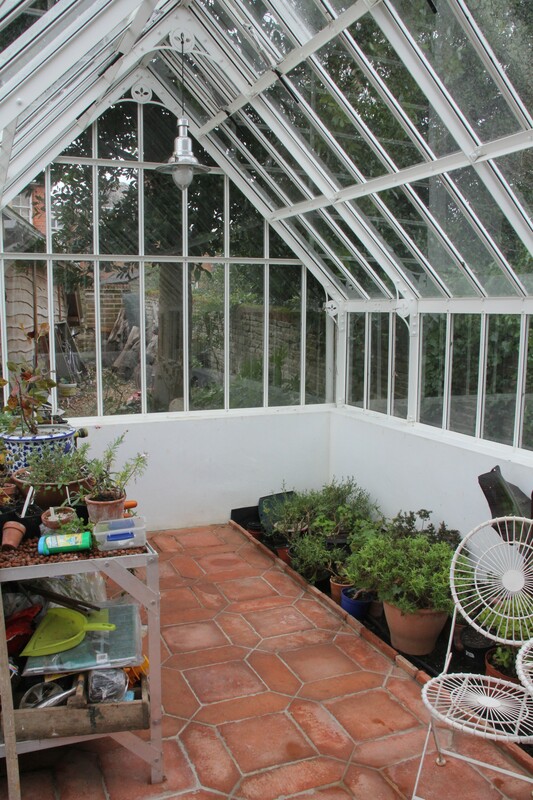 Such beautiful April weather and yet I still find myself gravitating to the greenhouse rather than doing ‘proper’ gardening outside. What’s that all about? Sort of tick. I delegated the pruning of the shrubs in the shady bed to the OH and he hacked through in a style which I’d like to say was reminiscent of Ross Poldark, but I can’t lie to you. He hacked through. Enough said. 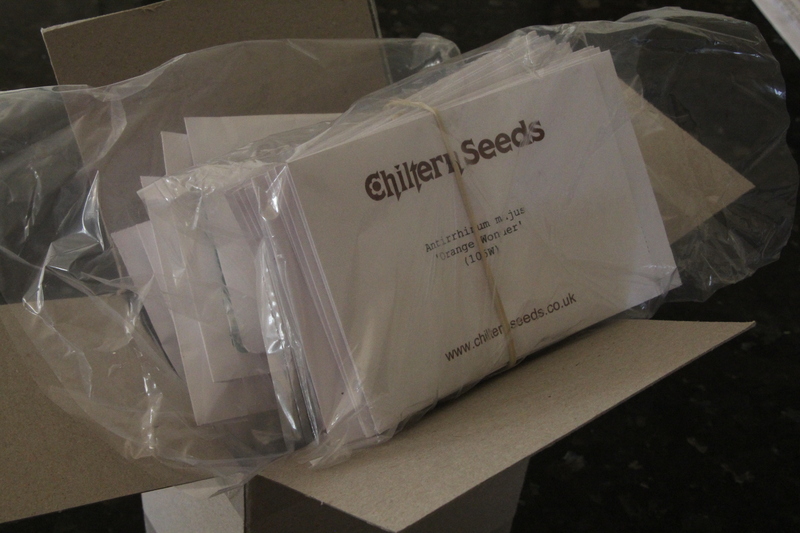 Oh the seeds and the seedlings – I’ve now planted over 75 different seeds this year. And no, I’m not entirely sure what I’m going to do with them all. No. As I mentioned last week, I have had the offer of space in J&A’s walled garden to grow cutting flowers and so now I need to plan which plants might survive the shady spot, which will require the sunny spot and which I should grow at home in the very shallow cutting beds I used last year. Tick. I planted out the last lot and then rigged up a cat’s cradle affair with poles and string. And forgot to photo it. 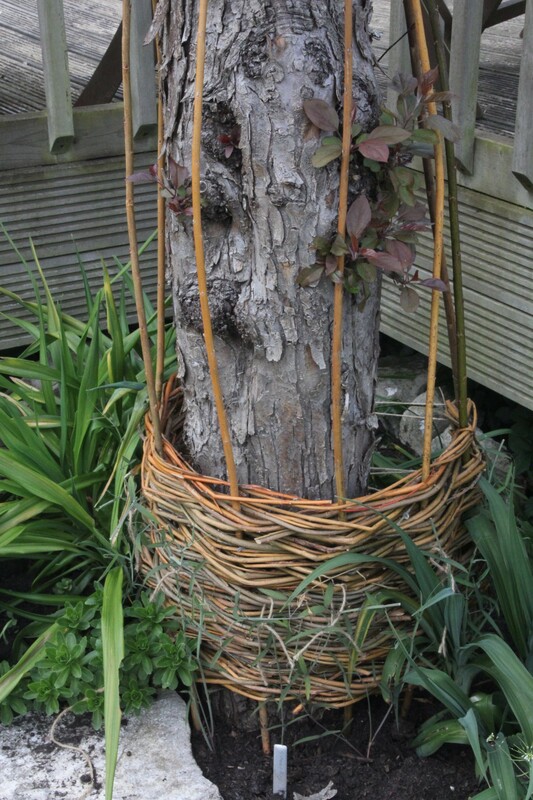 Sadly, the two largest willow structures we both made, which were made to fit into two particular pots, look rather ridiculously top heavy and so I think we’ll have to buy new pots to accommodate them, which wasn’t really the idea. 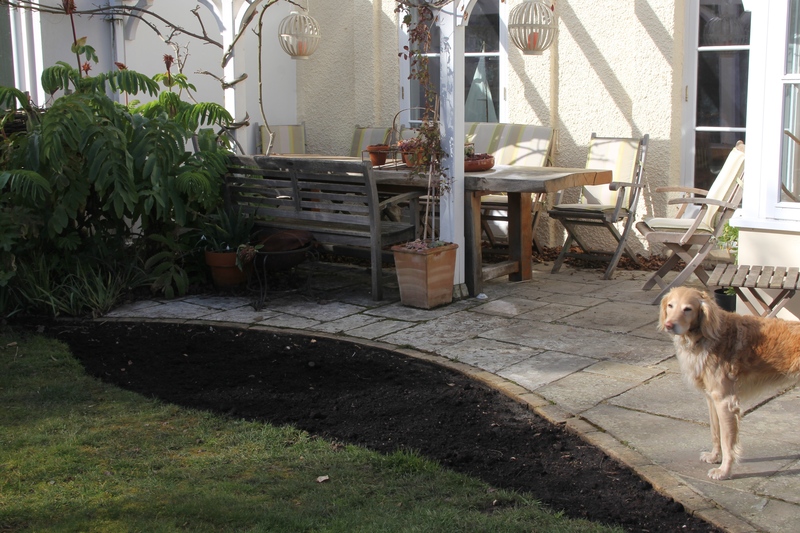 I’ve had a tidy of the shady bed (see top photo). 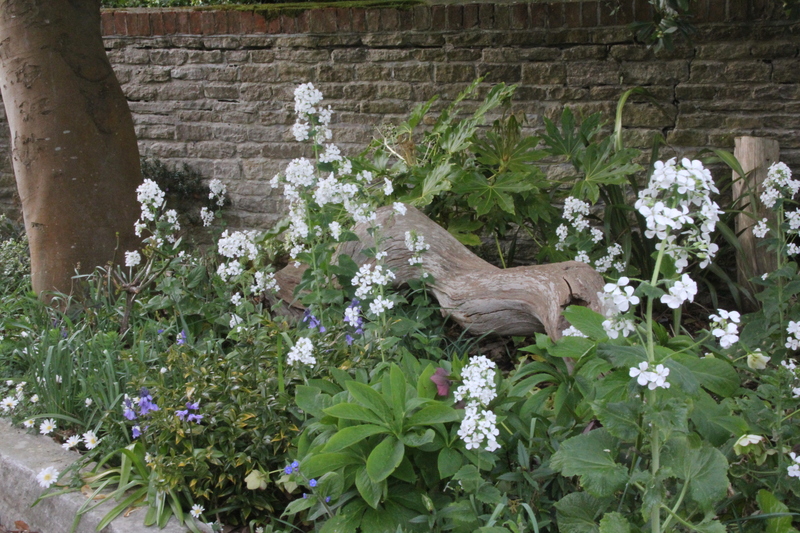 The white honesty I grew from seed last year is flowering well, together with the Anemone blanda White Splendour I planted as bulbs in the autumn. 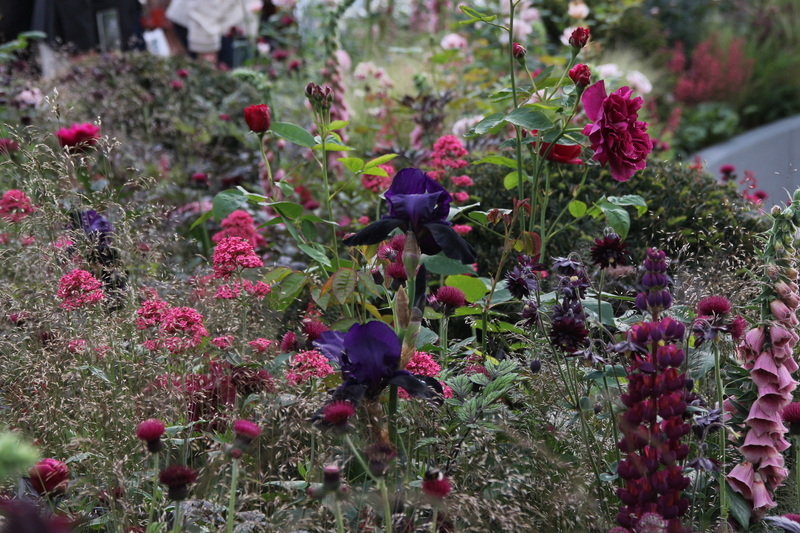 It’s a bit difficult to see what’s going on but there has been further planting. Firstly the new roses mentioned last month have gone in, including Rosa Falstaff Climbing on my ‘obelisk’. I’ve also planted out some Cirsium riulare ‘Atropurpureum’ I grew from seed last year. 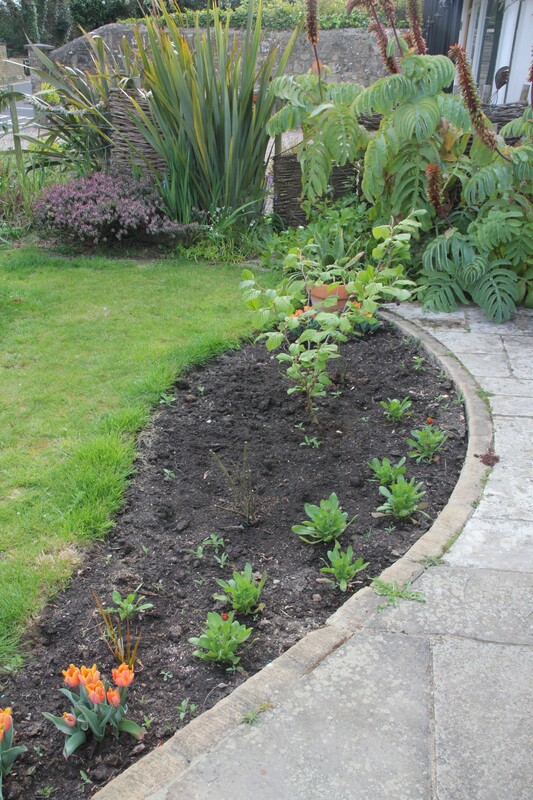 And also, since this photo was taken, I divided up a clump of Astrantia Roma and have put in a couple of clumps of that. 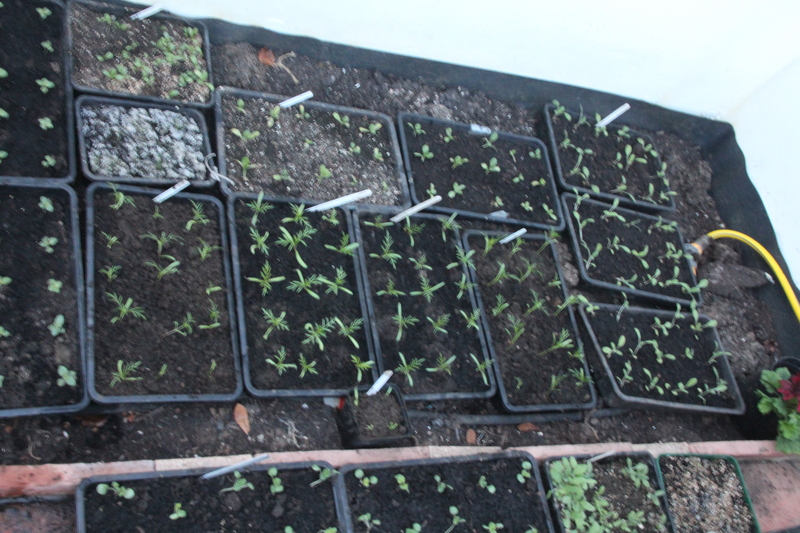 There are plenty of seedlings to go into the Bronze Bed but apart from a few more Calendula Sunset Buff, I haven’t planted anything else out. So not a bad month. What have you been up to in this glorious weather and what are your plans for the coming month? This entry was posted in Resolve and realise and tagged Anemone blanda White Splendour, Astrantia Roma, Calendula Sunset Buff, Cirsium riulare Atropurpureum, Cutting garden, Honesty, Lunaria annua on April 26, 2015 by jenhumm116. Well a much better month than last (although I’m a day late posting!) with all jobs pretty much completed. Tick. 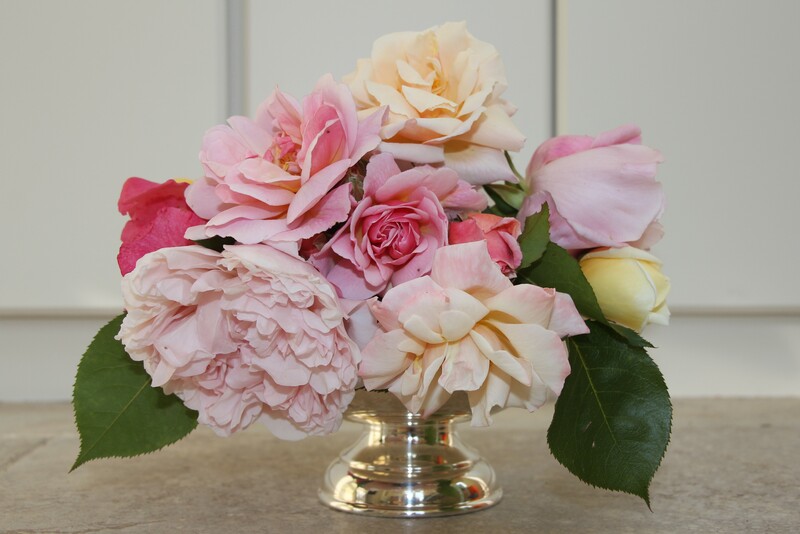 Herewith a photo of my roses from last year, rather than a pruned and fed twig, but trust me. I have some dahlias in the ground, some that were overwintered in the greenhouse in a large terracotta pot, and then these few, which were dug up and overwintered as tubers. I think it was because they were in pots I wanted to use for something else, but it’s all a bit of a blur now, and I certainly can’t remember their variety. Oops. 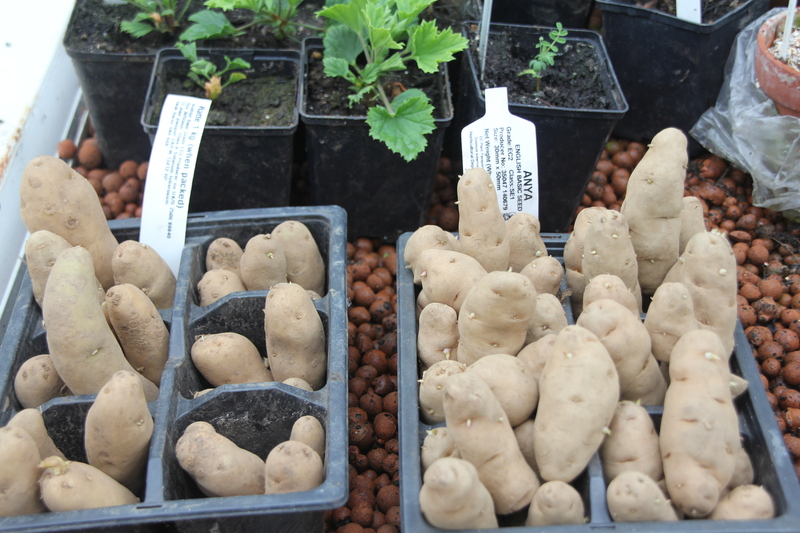 I finally got round to buying some potatoes – Ratte and Anya this year. I’ve also bought some potato growing bags for the first time, so I think I’ll put some in the ground (in the top ‘tier’ of the veg patch) and some in the potato bags. I’m planning to put the potato bags in the area of the veg patch behind the raspberry canes. It’s pretty dark but I did grow potatoes there before in the ground, but then they got blighted. Clearly I can’t grow them in the ground again, but hopefully they will do ok in the bags and make a difficult area productive. I need to provide some support for these, put at least they’re in the ground. 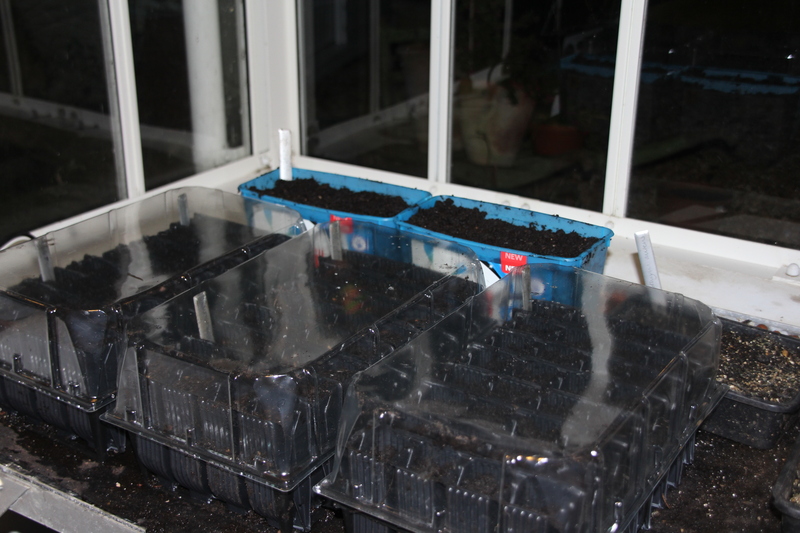 I have a second wave now in the cold frame which I’ll plant out in a week or so. Tick. I’ve never had much success with Aubergines, but I love to eat them, so I’m trying yet again. This year’s variety is Kaberi from Chiltern. Has anyone tried it? 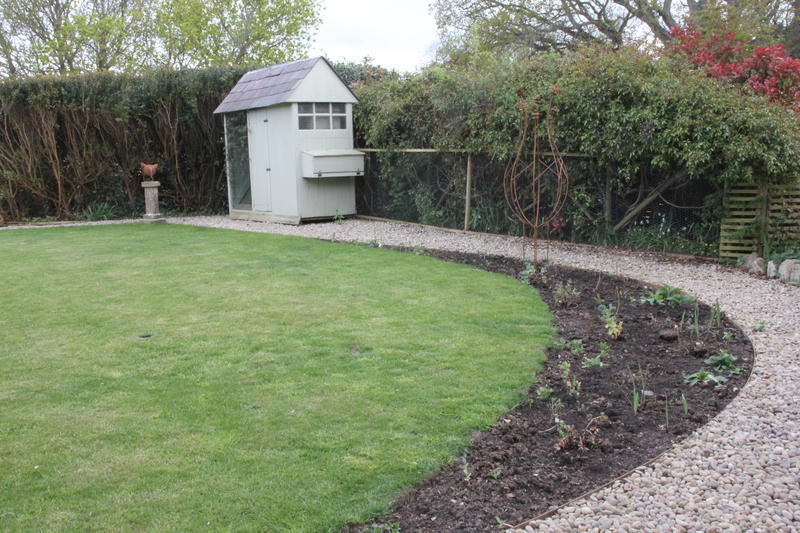 finish planning two new beds and start to buy seeds/plants accordingly. Nothing to carry forward – hurrah! If you’d like to join in with Resolve and Realise, please do, just leave a link to your post in the comments. This entry was posted in Resolve and realise, Uncategorized and tagged Aubergine Kaberi, Broad Bean Stereo, Padron Peppers, Rosa Falstaff, Rosa Jubilee Celebration, Rosa Munstead Wood, Rosa Pat Austin, Tomato Black Cherry, Tomato Country Taste, Tomato Ferline, Tomato Gardeners Delight, Tomato Sungold on March 30, 2015 by jenhumm116. Well I can see this is going to be the way of R&R posts – I’ll always start with an excuse! So this month, I’ve gone back to work AND spent this weekend in Kent at a birthday party. These photos were taken on Friday before I left, as nothing has happened since. Tick, the Bronze Bed is ready! But not only that, I’ve also created another new bed, the Mid Century Bed, shown in yesterday’s EOMV here. Not completely ticked. Although I have completed something related that didn’t even make it to last month’s R&R. I’ve dug out and topped up the strawberry and rhubarb bed. 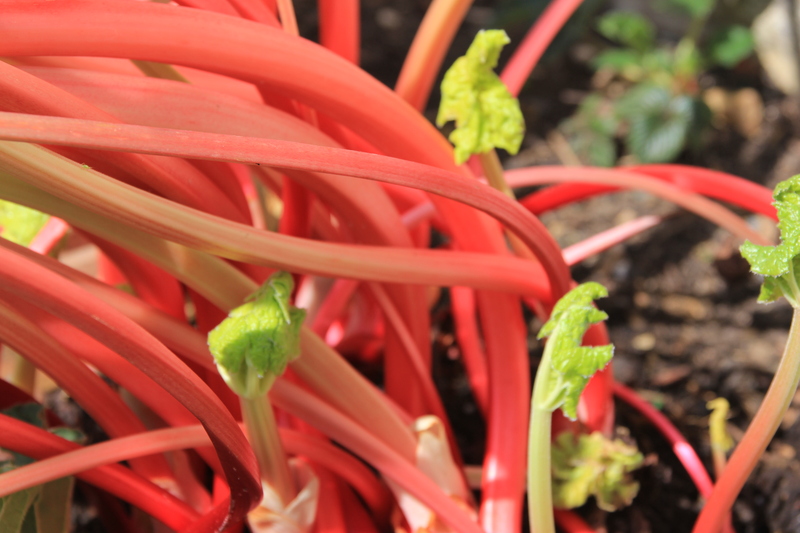 This bed had sunk considerably since it was created and so this month I’ve dug all the plants out, thinned the strawberries and divided one of the larger rhubarb plants, and then replanted them with at least an extra 4″ of compost and manure. I’ve also planted some of my Agapanthus grown from seed along the back wall. 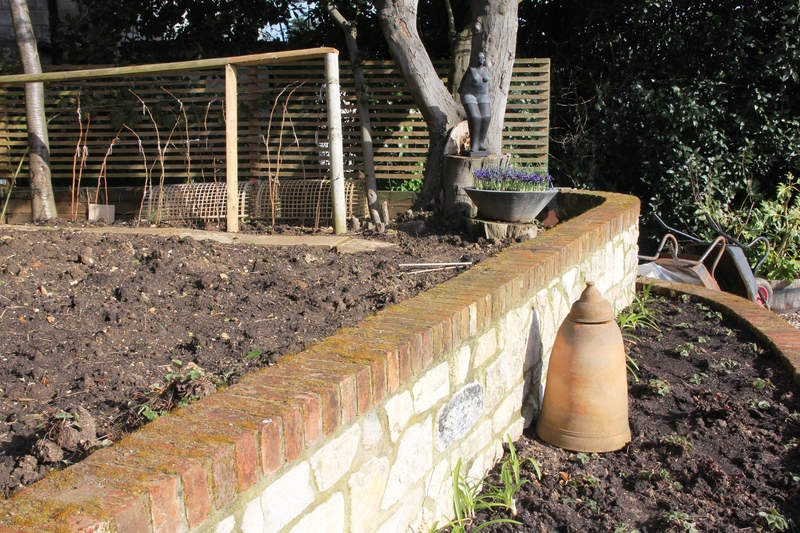 I don’t know whether they’ll flower this year, but I hope they’ll be happy with a warm southerly wall to cosy up to. Hmm, not quite a tick. I’ve completed the majority but not all. Difficult as I haven’t bought any. I’m flirting with the idea of growing them in bags this year as I’ve read a couple of articles extolling the improved flavour. I think I need to do a bit more research, but would love to hear your experiences with container grown potatoes. Well I have sown a few more left over seeds, but again difficult to make much progress when I didn’t receive the new seeds until recently! 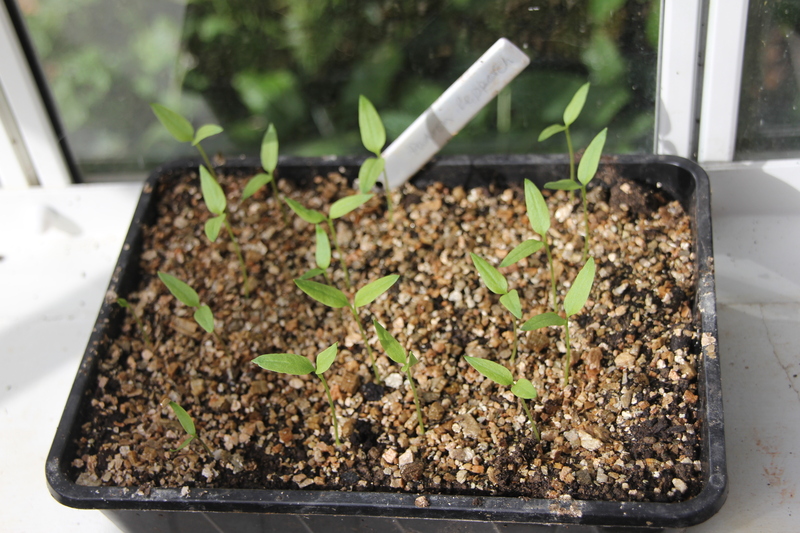 Well they’ve made it from the greenhouse to the cold frame. Surely that deserves half a tick? So, all in all, hopeless progress. I’m blushing as I type. As a consequence my carried forward list is long, but my new additions short. I need to get a grip! 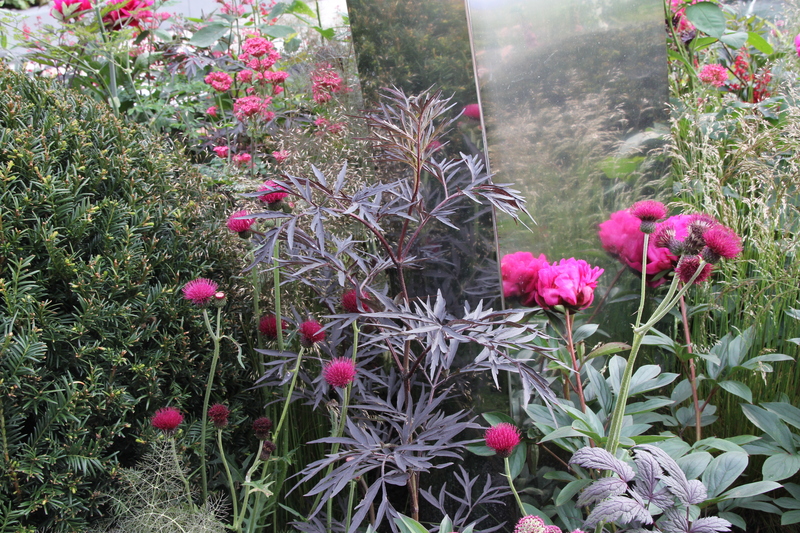 To finish, a couple more views of the Stoke City Garden at last year Chelsea Flower Show, the inspiration for my new Mid Century bed. This entry was posted in Resolve and realise and tagged Agapanthus, Bronze Bed, Chiltern Seeds, Derry Watkins, Mid Century Bed, Sarah Raven on March 1, 2015 by jenhumm116. Whilst writing down my January plans definitely helped concentrate the mind, as with all plans, they don’t necessarily go exactly to, well, plan! 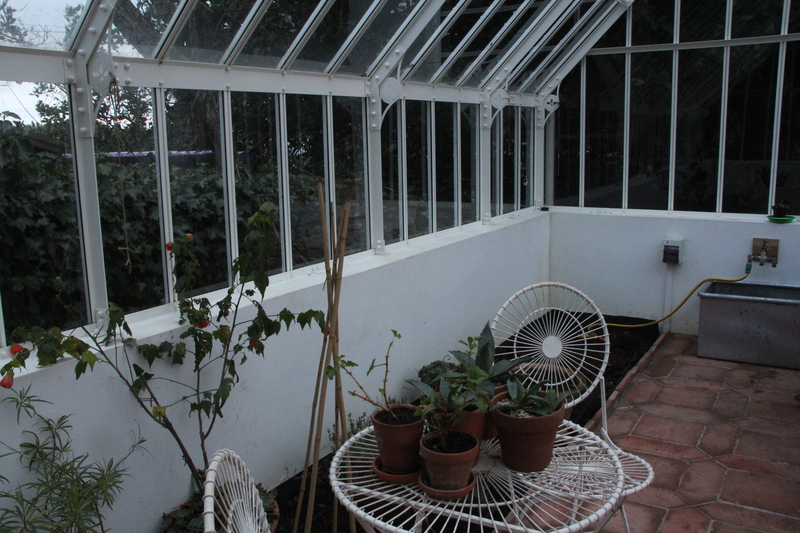 Well I hope you’ll acknowledge that the greenhouse looks a lot more spick and span than last month. I’ve cleaned all the inside panes of glass apart from the very top, but think I’m going to have to get a window cleaner to do the outside. I’ve also had a good clear out and power washed the floor. Tick. Tick! Although it could now do with a feed. 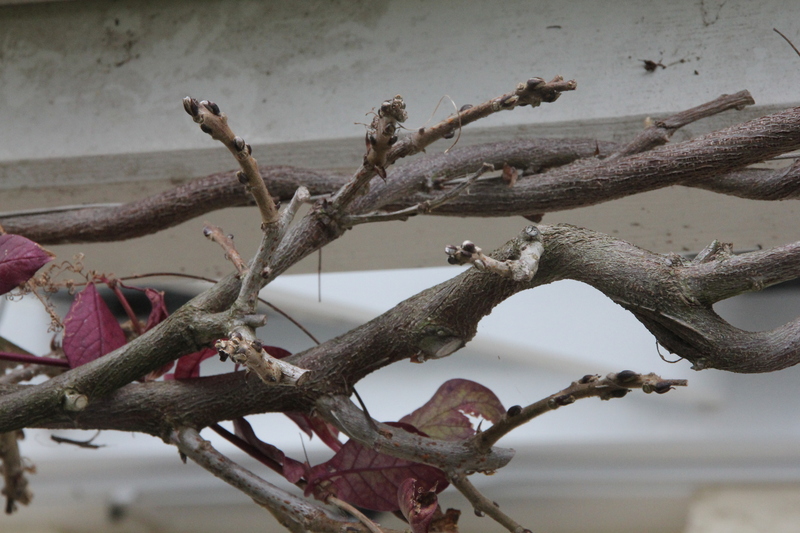 The vine runs along the front of the decking, at the back of the two troughs and was planted by the OH (a vine has never featured anywhere near the top of my plants wishlist). 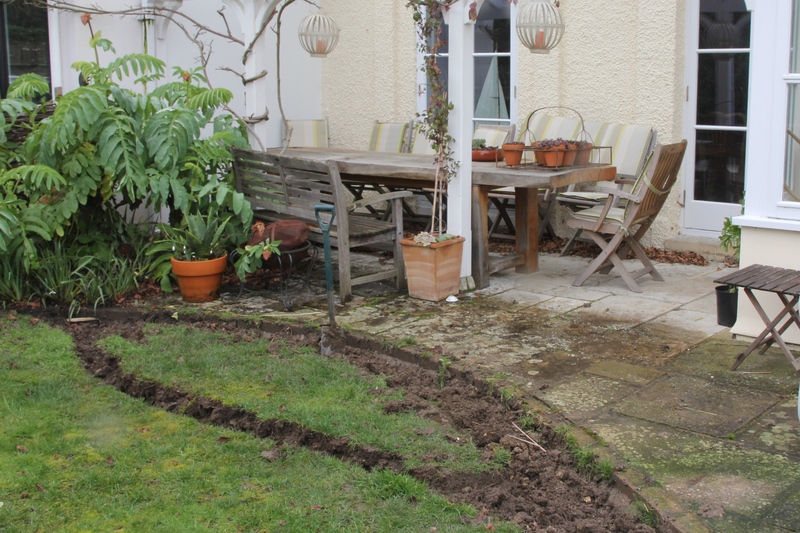 It was also trained along a wire which ran along the base of the decking and as a result got knotted up with all the planting in the troughs which was very annoying. 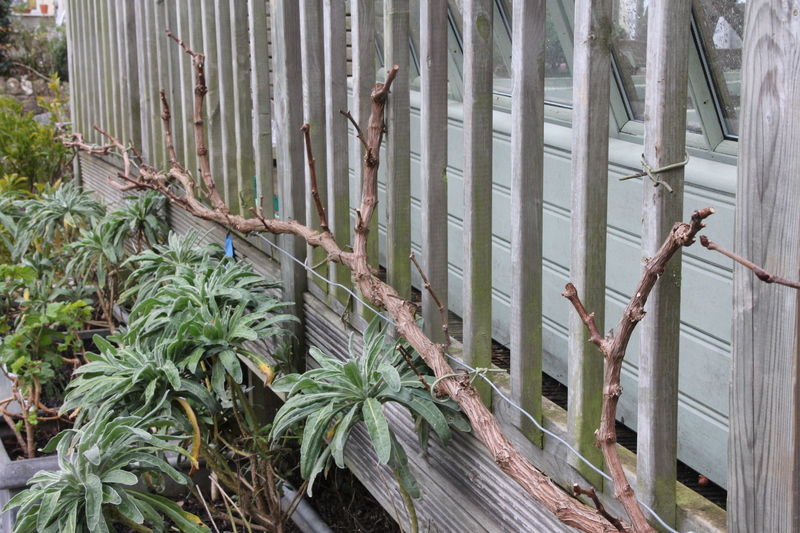 So, as well as pruning, I’m delighted that I’ve also persuaded the OH to move the wire up by a foot or so which should hopefully reduce this summer’s entanglements! Hmm. No tick. Whilst I’ve dug down a spade full and marked the new edge of the bed, this represented six or seven wheelbarrow loads of heavy, clay soil and I’ve got in rather a knot as to what I’m going to do with the spoil. 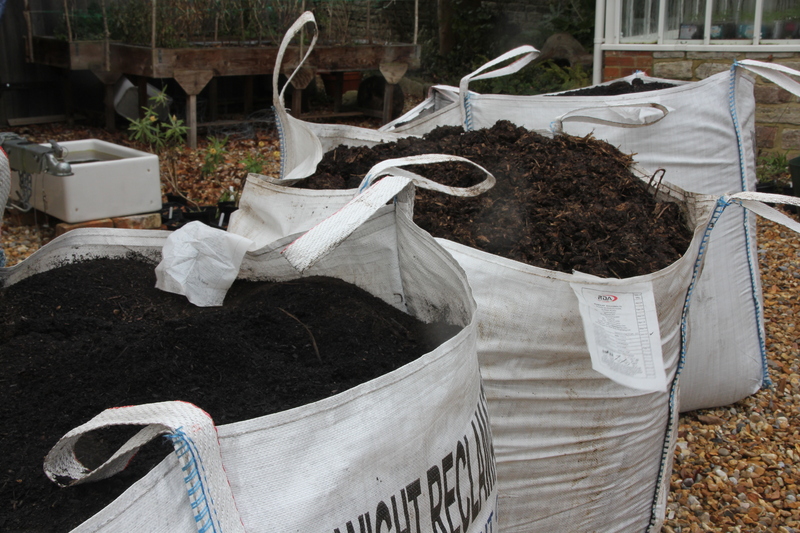 At the moment I’ve been putting it in empty compost bags (see big white bags below) but think we’re going to have to pay for someone to ‘grab’ them away. Well Tick and then darn it, unTick! It really is very annoying to lose bulbs for the second time. 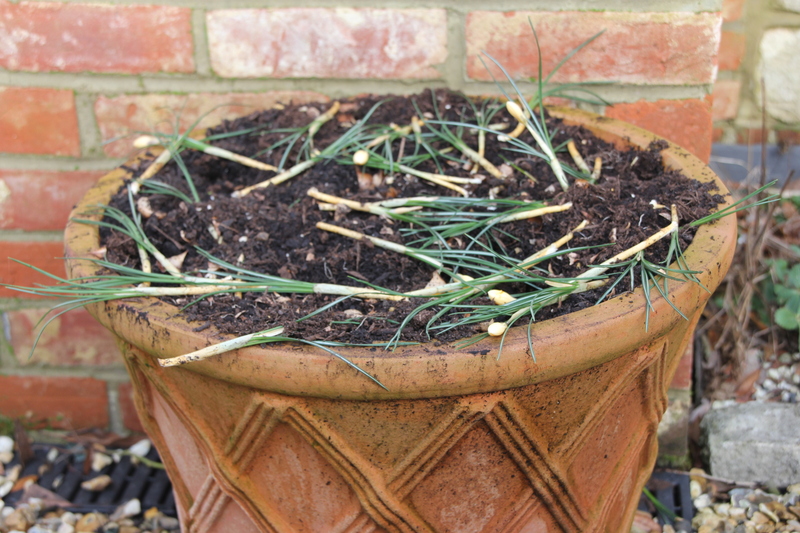 And the weird thing is that last year I had a lovely show of crocuses with no extra protection. As I said in the comments after I posted this picture on Wordless Wednesday, I thought by the time bulbs were flowering, most of the goodness had been used up and therefore they weren’t as attractive to predators. Clearly I was wrong. Tick! Forgot to photo, but I should also feed. Definitely no tick. All I’ve done is to order the compost and manure I use for mulching. A pathetic effort. Definitely to carry forward. 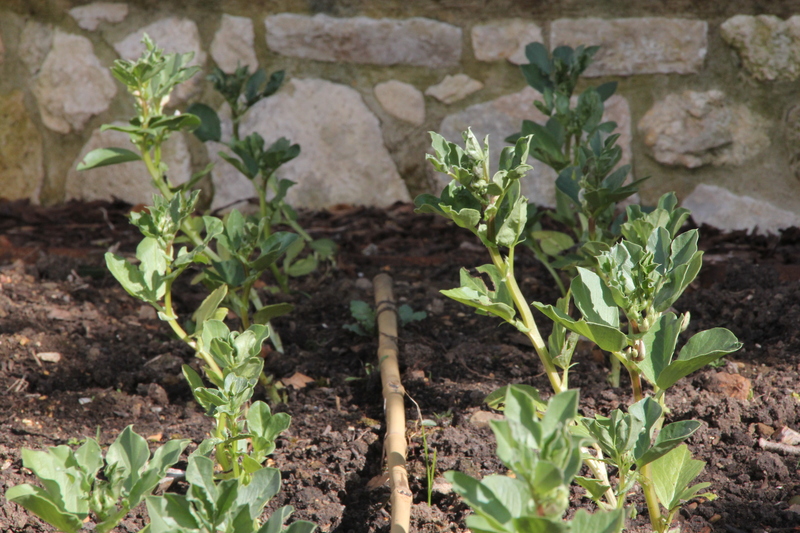 This entry was posted in Resolve and realise and tagged Broad Beans, Cobaea scandens, Compost, Crocus, Rhubarb, Sweet peas, Vine, Wisteria on February 1, 2015 by jenhumm116. You know that saying “if you want something done, ask a busy person”? Well a year ago I was that person. I was working (and staying) in London, three days a week, as well as working a further day from home. Consequently, all my gardening had to be fitted in between Friday and Sunday. And do you know what? I was far better at getting things done then than I’ve been over the last year, when I’ve been working far less, and rarely away from home overnight. I find the lure of the sofa, a good cup of coffee and a gardening magazine often wins out over getting the wellies on and getting out there. Procrastination, I love it. But it’s got to stop, and this is my plan. I’m going to share a monthly ‘Resolve and realise’ post where I plan (resolve) to do a number of things over the coming month and then the next month share what I’ve achieved (realised). Not only do I think it will help concentrate my mind over what I should be up to, but it will certainly concentrate my mind over what I’ve actually done. Bizarrely, I love a deadline almost as much as procrastination, and for me, it’s definitely the lack of one that leads to the other! If anyone would like to join in with me, please feel free, just leave a link with your comment. In future, I plan to write these ‘Resolve and realise’ posts on the first Sunday of the month, so the next one will be on 1st February. This entry was posted in Resolve and realise on January 18, 2015 by jenhumm116.